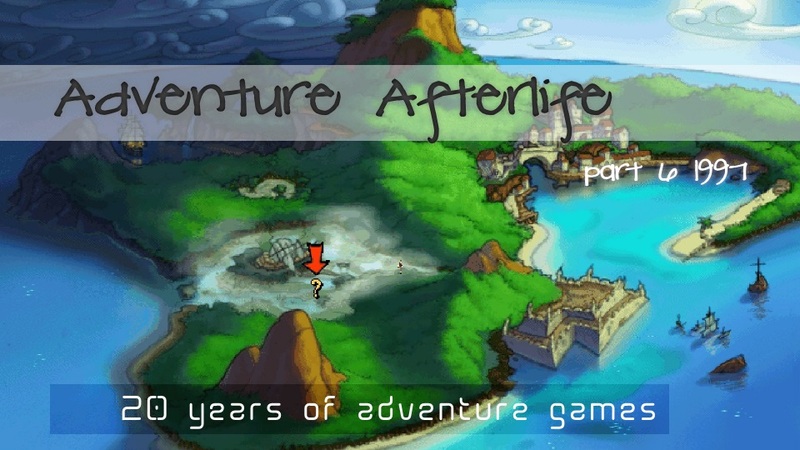 For those of you who have not read any entries in this series these before, I’m playing through a couple of adventure games from each year following the release of Monkey Island 2. It’s been over a year since the last entry, a lot has happened for me personally. I had a really terrible time for a lot of last year, but happily at the end I managed to achieve a pretty big career goal. 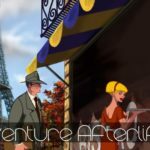 The last few years have been incredible for the adventure game genre, ( there’s never been a better time to be playing video games) but people are still dragging out the old adventure games are dead thing, and I’m still getting frustrated. It’s especially annoying when I see games that have original voices, or distinctive game worlds selling themselves short. 1997 was a heck of a year for games, Final Fantasy VII was released wowing console audiences and shipping a heck of a plot of PlayStations. Mario Kart, Star Fox and GoldenEye were released on N64. On PC 1997 was also the year Quake shipped. The Last Express is a really interesting game. I’ve been meaning to play it for years, after I tried and failed to run it on my underpowered phone a few years ago I finally picked up the Gold Edition on Steam. It’s kind of incredible to me that it came out in 1997, whilst FFVII used FMV cut scenes to incredible effect, there was still a separation between game and cut scene. 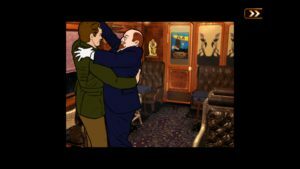 The Last Express uses rotoscoped actors, who move around a the Orient Express to set schedules, meeting and conversing with other passengers. 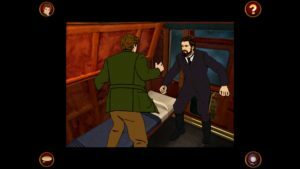 Much of the game involves the player snooping on these conversations, and later in passengers rooms trying to solve your friend’s murder, avoid detection ( as a stowaway and escaped criminal)and retrieve a lost treasure. If the player meets another character in the narrow confines of the train they’ll often apologize and get out of the way. There’s an incredible sense of place and time. It’s also worth mentioning that the game was directed by Jordan Mechner, who created both Prince of Persia and Karateka who paved the way for rotoscoping in games with the first prince and is also a screenwriter in addition to game designer. I had a bomb in my pocket at the time, the game didn’t react to it…but the scene sure was tense. The game is broken into discrete chunks of story in roughly two hour time period in which time ticks by as you play, in order to pass to the next one the player has to complete certain objects before they run out of time and (usually) die. If you fail the game will then send you back to try again. The framework of different train stops is used to indicate this but other than that it’s up to the player to figure out what they need to do. The re-release on Steam adds a hint system that will step in if you want when you die. Whilst I usually hate using hint systems, I found it helpful in my playthrough. The freedom can be in part exhilarating as you eavesdrop on an important or interesting conversation, figure out a clue or experience the thrill of learning something you shouldn’t. The time aspect adds a tension, that elevates the drama and reminds you that you’re in a video game and it wants you do complete your tasks or it will kill you. It seems designed for you to fail and try again, so you experience different aspects of the game. Whilst you sit in the dining car listening to a couple chatting, two of the train guards might be having a juicy conversation elsewhere. You can talk to these other passengers, always mindful that some of them are probably lying to you. The combat in the game is a bit of a pain. There are a number of puzzles scattered about, that rely on you finding the right inventory items in time or else paying attention to the movements of others on the train. If you discover someone else snooping in the train compartments, is it a good idea to leave the giant gold egg you retrieved in your room? With some of these puzzles you’ll likely fail before you discover there’s a problem and things begin to feel like a Groundhog day experiment where you try to learn the right steps in the right order. There are also a few puzzles such as a bomb defusal where I knew what I wanted to do but had no idea how to tell the game how to do it. At other points I just had no idea where I was meant to be going or what my aim way in that time period.The navigation can be fiddly at times, and there are also a number of combat sequences that require clicking in the right place at the right time. It’s always hard implementing combat in these kinds of game, but I just found it too fiddly to gain any satisfaction from. Overall though it’s an incredible game, which I don’t hear talked about enough outside adventure game discussion. It’s sometimes frustrating, but rewarding. It has an incredible sense of place and time which wasn’t really present in a lot lot of other games of this time. It uses the interactivity and the players sense of time and place to tell it’s story. If you ask people to name a point and click adventure it’s likely Monkey Island will appear on there somewhere. The series is often brought up in general adventure game discussions, by players who often haven’t played any other adventures. Monkey Island 1 & 2 are the most often cited, widely played on both PC and Amiga, the strong world, humor, and characters have left a mark in many gamer’s brains. 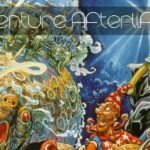 You’ll also remember it’s after Monkey Island 2 was released, I set the start of this blog series. Curse of Monkey Island is the first Monkey Island without series creator Ron Gilbert at the helm. 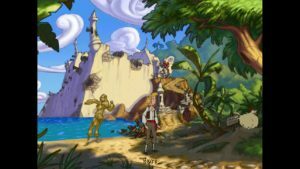 While it would spawn a further two games; Escape from Monkey Island and Tales of Monkey Island, there’s a sizable contingent of fans who want a ‘rue’ sequel to Monkey Island 2. It’s a weird feeling for a game to have so many sequels, yet it feels unfinished; until recently I’d have compared it to the same feelings that swirl around Shenmue 3. I’ll probably revisit Escape and Tales, later but for this entry I want to focus on Curse. 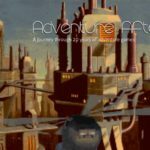 It appeared recently on Steam and Gog with no fanfare and a barebones ScummVM implementation. Whilst the game runs and is still enjoyable if you play you’ll need to use ScummVM’s save system as the original doesn’t work in modern windows. I managed to loose a save by leaving it idle on the title screen where ScummVM’s autosave wiped over my progress. It’s nice the game is available again, but there’s little context to the release; and it would have been nice if the game received the same love as Full Throttle. What did they do to Elaine?? 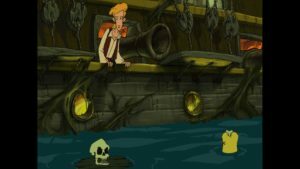 Curse of Monkey Island sees the series shift to cel style animation, there’s an almost Disney-esque quality to it. The original Pirates of the Caribbean ride was a big inspiration to the original games, so it’s apt but does mean the game loses some of the weird grossness from the originals. It was also the first game that was voiced, the cast were reassembled the voice the special editions of 1 & 2 which I suggest you play with the fan patch that lets you enjoy the VO without the awful new graphics. The cast is superb, Dominic Armato is the voice of Guybrush. The game also introduces the character of Murray who feels very much part of the series, driven by excellent dialogue and a hilarious performance by Denny Delk. The game makes use of the higher fidelity music and vocal performances to great effect. 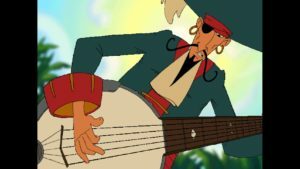 Music is a huge part of the game, there’s a segment where Guybrush finds himself on a ship with a crew who refuses to do their job and instead launch into a sea shanty. The player then gets to pick dialog options which then integrate back into the song. All this is sung in time to the music and is just magical. with at this screenshot…the evil..oh the eeeevil. There’s a ton of extra dialog in the game, and it’s fun just to explore the world and talk to the pirates. There are also a lot fun responses if you use the wrong item on a character, and after obtaining a balloon early on can spend as much as the game as you like speaking in a squeaky helium voice.The puzzles are generally enjoyable, there are a few pixel hunts and the odd twist of logic. It’s perfectly possible to solve them in different orders, largely because the instinct to steal anything and everything is so strong. I’d still prefer the game let me do this then force linearity. The writing is also extremely good with plenty of masterful callbacks to the original games which feel appropriate and integrated with the story. Stan the salesman shows back up, but just as he did in pixel form the squares of his jacket resolutely refuse to move when he does. My main criticism is as right as it gets Monkey Island there are few places where it misses the mark. These largely focus on Elaine, the plot has Guybrush propose to Elaine his love interest from the first two games, leading her to accept a cursed ring that turns her to gold. Whilst this twist is very Monkey Island, their relationship felt a little more ambiguous in the earlier games. Elaine was often off solving her own problems, which generally got spoiled by Guybrush. There’s a lot of ambiguity in Monkey Island 1 & 2, and some readings of the game have you question how much is real. Curse looses some of the ambiguity, as a result of the higher res art and main arc. Curse sits in an interesting position of being an awesome game it’s own right. It used the tech of it’s time to tell it’s story well, so perhaps it’s unfair that it’s often compared to an imaginary Monkey Island 3 that never actually got made. I can’t think of many games that use music and animation in quite this way. It’s still funny, and the characters new and old stand out as some of my all time favourites in games. It’s sometimes a bit of a pitfall to look at games purely through tech, in the case of both Last Express and Curse of Monkey Island the tech was used to well effect to tell their stories. Animation, and professional actors were called in to capture not only voice but movement. Strong narrative game design and implementation uses the technology at hand as an integral part of the storytelling. The narrative isn’t just the words, it’s all the elements coming together. They use many of the same tools but in different ways that are appropriate for the stories they tell. 1997 was an astounding year for games. Both are available on Steam & GOG, so I encourage you to seek them out and try them for yourselves.